First up tonight are L Sol Tace. As is so often the case for the first band on a bill, the crowd is pretty sparse but the band don't seem fazed by this. Their music is good heavy stuff with screaming/growling vocals and plenty of power. The band's drummer reminds me of Animal from The Muppets with his long hair and arms flailing in all directions as he pounds the hell out of his drums. A decent choice as an opening band. Next up are Stuka Squadron - the self styled Nazi vampires. They are head and shoulders above L Sol Tace in my opinion in terms of both performance and music. Their vampire teeth, leather coats and nazi caps create a good theatrical image and the band play up to that. Musically too they were excellent - a band I look forwards to seeing again. Tonight though belongs to Evile. Tonight's show is the first of two album release shows taking place ahead of the UK tour in October, and unsurprisingly we get plenty of new songs tonight - the setlist includes six songs from the new album, Five serpents teeth. Right from the start of their set, Evile demonstrate their power, speed and the tightness of their performance and show the audience why they are considered one of the best UK Thrash bands around with most young bands coming nowhere near Evile's level. The new material goes fown a storm with the fans, and the number of people singing along to some of them suggests that the album is already selling well (and deservedly so - its their best album yet). Cult gets a particularly good reception from the crowd - probably better even than established tracks such as Infected nations or Thrasher. The venue which was aroun two thirds full transformed during Evile's set, from an audience of people watching bands to a sea of headbanging and moshpits. 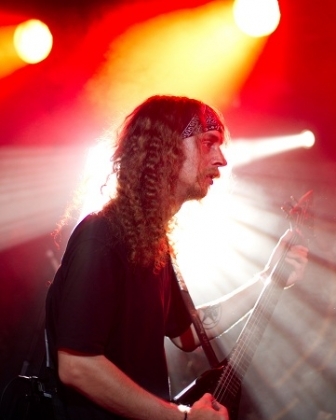 A great performance by Evile who continue to get better and better. Considering that tonight is their first time playing some of these tracks live, they are note perfect and look and sound as though they've been playing them for years - if they're this good now then I can't imagine how good they'll sound by the end of their UK tour. A great night of music - Evile in particular put in a great performance to showcase their great new album.